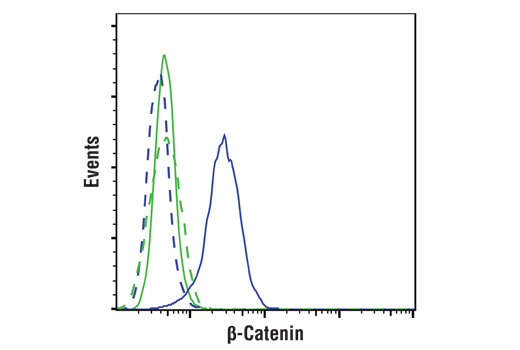 Western blot analysis of extracts from various cell lines using β-Catenin (D10A8) XP® Rabbit mAb. 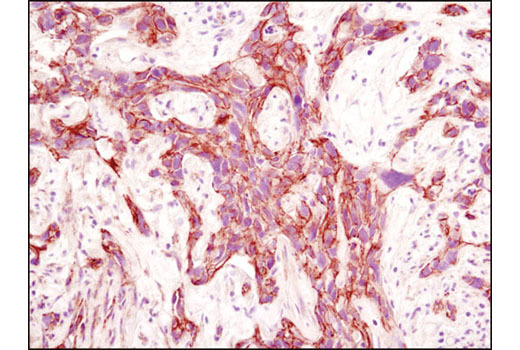 Immunohistochemical analysis of paraffin-embedded human breast carcinoma using β-Catenin (D10A8) XP® Rabbit mAb. 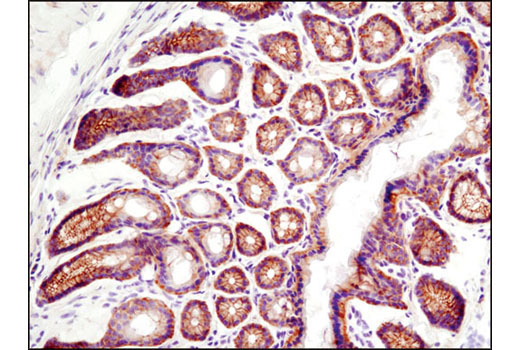 Immunohistochemical analysis of paraffin-embedded human colon carcinoma using β-Catenin (D10A8) XP® Rabbit mAb. 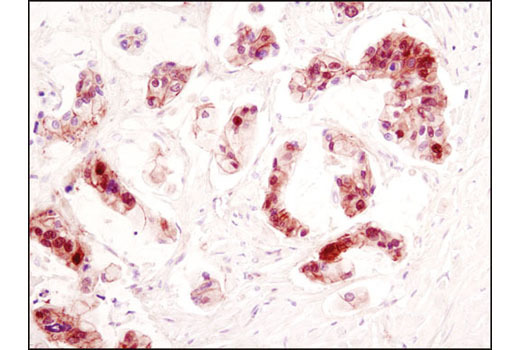 Immunohistochemical analysis of paraffin-embedded cell pellets, HeLa (left) or NCI-H28 (right), using β-Catenin (D10A8) XP® Rabbit mAb. 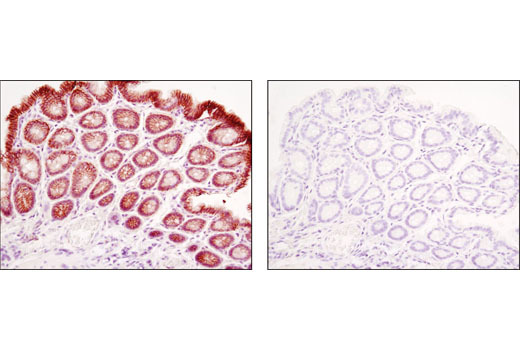 Immunohistochemical analysis of paraffin-embedded mouse colon using β-Catenin (D10A8) XP® Rabbit mAb in the presence of control peptide (left) or antigen-specific peptide (right). 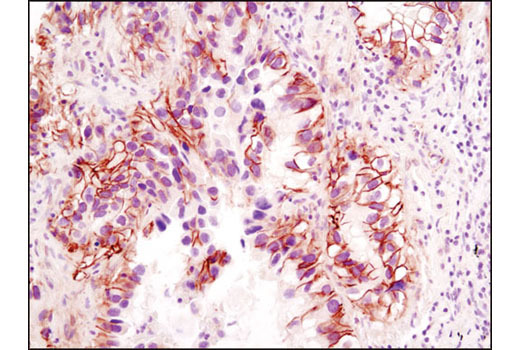 Immunohistochemical analysis of paraffin-embedded human lung carcinoma using β-Catenin (D10A8) XP® Rabbit mAb. 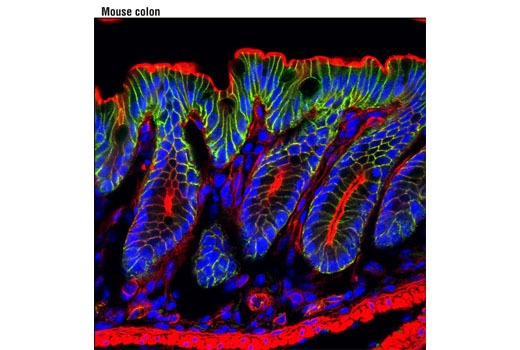 Immunohistochemical analysis of frozen mouse colon using β-Catenin (D10A8) XP® Rabbit mAb. Confocal immunofluorescent analysis of mouse colon using β-Catenin (D10A8) XP® Rabbit mAb (green). Actin filaments were labeled with DY-554 phalloidin (red). Blue pseudocolor = DRAQ5® #4084 (fluorescent DNA dye). 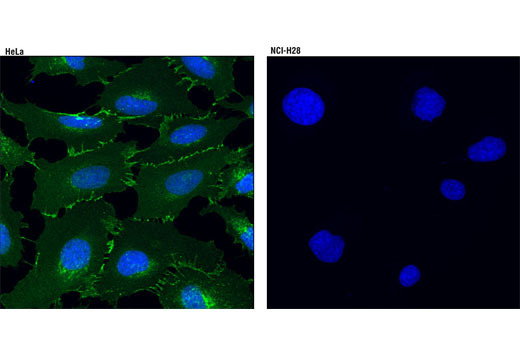 Confocal immunofluorescent analysis of HeLa (left) and NCI-H28 (right) cells using β-Catenin (D10A8) XP® Rabbit mAb (green). Blue pseudocolor = DRAQ5® #4084 (fluorescent DNA dye). Flow cytometric analysis of NCI-H28 cells (blue) and HeLa cells (green) using β-Catenin (D10A8) XP® Rabbit mAb (solid lines) or concentration-matched Rabbit Isotype Control #3900 (dashed lines). Anti-rabbit IgG (H+L), F(ab')2 Fragment (Alexa Fluor® 488 Conjugate) #4412 was used as secondary antibody. Chromatin immunoprecipitations were performed with cross-linked chromatin from HCT116 cells and either β-Catenin (D10A8) XP® Rabbit mAb or Non-phospho (Active) β-Catenin (Ser33/37/Thr41) (D13A1) Rabbit mAb #8814, using SimpleChIP® Enzymatic Chromatin IP Kit (Magnetic Beads) #9005. DNA Libraries were prepared using SimpleChIP® ChIP-seq DNA Library Prep Kit for Illumina® #56795. 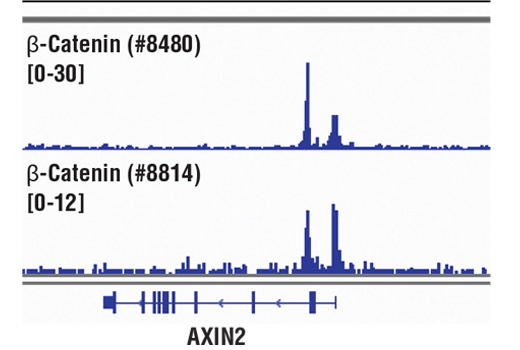 The figure shows binding across AXIN2, a known target gene of β-Catenin (see additional figure containing ChIP-qPCR data). For additional ChIP-seq tracks, please download the product data sheet. 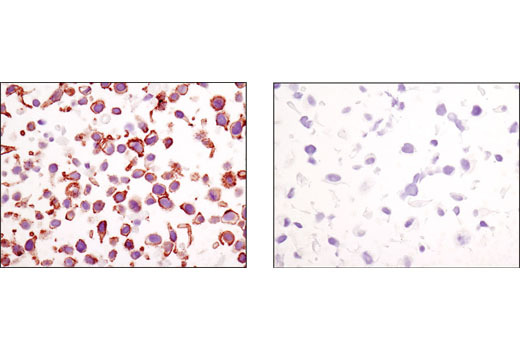 Chromatin immunoprecipitations were performed with cross-linked chromatin from HCT 116 cells and either β-Catenin (D10A8) XP® Rabbit mAb or Normal Rabbit IgG #2729 using SimpleChIP® Enzymatic Chromatin IP Kit (Magnetic Beads) #9003. The enriched DNA was quantified by real-time PCR using SimpleChIP® Human Axin2 Intron 1 Primers #8973, SimpleChIP® Human CaMK2D Intron 3 Primers #5111, human c-Myc promoter primers, and SimpleChIP® Human α Satellite Repeat Primers #4486. The amount of immunoprecipitated DNA in each sample is represented as signal relative to the total amount of input chromatin, which is equivalent to one. 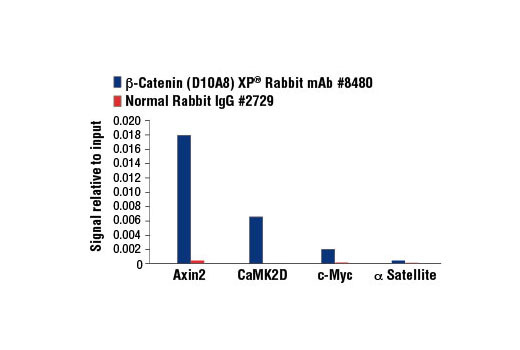 β-Catenin (D10A8) XP® Rabbit mAb recognizes endogenous levels of total β-catenin protein. 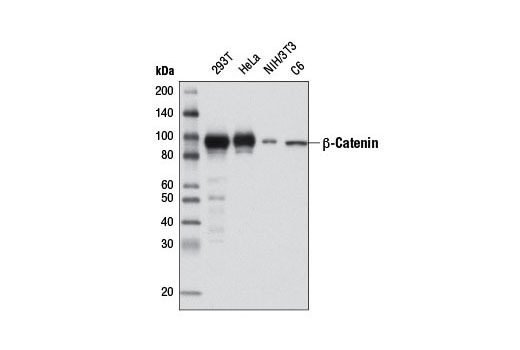 Monoclonal antibody is produced by immunizing animals with a synthetic peptide corresponding to residues surrounding Pro714 of human β-catenin protein.